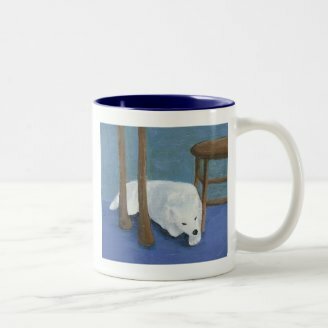 If you like animals, especially dogs, and folk art, here's some samples of unique mugs and gifts. I am mostly a self-taught artist although I spent one lovely year attending classes and workshops with a wonderful artist, Kathy Lund, in Newburyport, Massachusetts. She gave me encouragement and inspiration to try new things. I probably would be a better artist if I practiced every day but I get distracted. There are so many ways to express your creative side. Music, fiber art, writing, and photography are just a few of the arts I love. Painting has always been difficult for me to share since you have to exhibit or sell in order for others to see it. 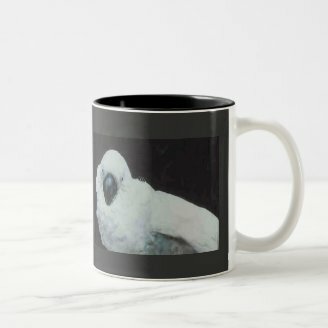 Now with the internet and sites like Zazzle, I can share my art with the world. These are some of my pictures that I have put on mugs. I’ve always loved painting and drawing animals. 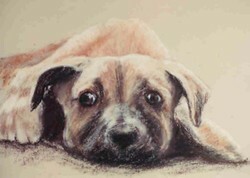 The subjects I had closest to hand were dogs, but other animals appeared in my portfolio from time to time. This little Samoyed pup was brought to my dog grooming shop for a bath and brush. He was so funny and easy-going that I let him out of the cage to walk around. He settled down in a few minutes and fell asleep under the table. I grabbed my camera and took a picture that became this little painting. I’ve had several greyhound rescue dogs over the years. A couple of them were puppies. This pup was my last one named Catcher. He loved to play ball and was a great dog. I was going though a spell of painting interiors so I put him in a room with fancy wallpaper and his favorite toy. I love watercolors but I found them very hard to work with. I set them out one day and decided to work on it until I got it down. This painting is one that I thought came out well. It is a painting of a young, hand-raised cockatoo named Alex. He was raised in a pet shop until he was old enough to go home with his new family. He was a sweet thing and I really wanted a good picture of him. I love folk art. I love the message that anyone can create art if they want to. There are no rules and restrictions. If it pleases you, that’s what counts. I especially love the folk art that depicts animals in a pastoral scene like these sheep I did with the colonial style trees. I went through a period of painting folk art and found it was a lot harder than I thought it would be, still it was fun to do. I fell in love with this old dog who belonged to a friend of mine. I simply had to do a pastel painting of her. It was one of the best I had ever done. There simply was something about the expression on this dog’s face. Even as a black and white I think it captures this dog’s wonderful personality. You're artwork is absolutely lovely, Ragtimelil! Thanks, Sue. You are right. 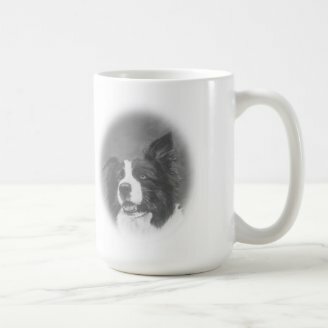 There are deals all the time on Zazzle! Thanks. I enjoyed doing time. If I can get my scanner working again, I might take up painting again. Thanks guys. You don't have to use original artwork. You can use public domain images too. I love your mugs! 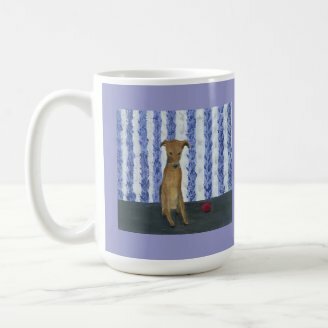 I've thought about opening a Zazzle store, but I can't draw a stick figure! I guess I could use my pet photos, alter them some, and use them. Enjoyed yours! These are wonderful. Love your artwork. Thanks so much Sheri, Nick and Sue! I really appreciate your comments and help! Wow. Great art on these mugs. 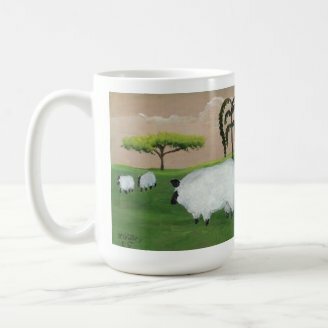 I will be ordering a sheep mug.